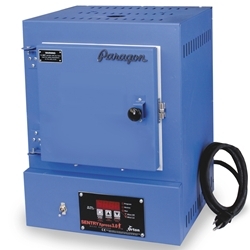 The digital SC3 oven from Paragon is used for lost-wax casting and also fires precious metal clay, enamels, and glass in minutes up to 2000°F. The SC-3 is popular with seminar teachers because it fires so fast and plugs into a 120 volt outlet (240V also available). The SC3 fires automatically at the rate and temperature you enter on the built-in controller. A large, brightly lit display prompts for firing rate, temperature and hold time. Use the hold feature to automatically soak any type of precious metal clay to its recommended time or to hold flasks at desired temperature for casting. The ceramic fiber firing chamber is wrapped in a steel inner case. The outer steel case remains cool due to the layer of air between it and the inner case. In addition, the case is slotted for air circulation. Electrical components, located in the base, stay cool even at extended hold times. The fast firing element is embedded in the firing chamber shell. The SC3 heats from the two sides and back. It includes a top vent for lost wax casting. Built-in base; no extra stand needed. Door opens 180 degrees for easy loading. The case is slotted for air circulation. Electrical components in the base stay cool even at extended hold times. The embedded element heats from the two sides and back. Top vent complete with tapered plug for lost wax casting. Includes a 1/4” thick ceramic fiber shell. Ships by UPS. Specially designed carton and foam padding assures that the kiln will arrive safely. The reliable Sentry Xpress 3-key Controller is packed with features. It includes two modes: Single Speed and 8-segment Ramp-Hold. Colorful, illustrated instruction manual (see "Manuals" tab above for a PDF). Please note these are high resolution PDFs and may take a minute to download. Please be patient.